I had been meaning to go to The Lockhart for a while after I met a couple of the owners at a party last Summer (dahling) and they'd talked excitedly about their passion for mezcal, reflected in their cocktail menu; I bloody love mezcal. But it took me a few months to get there and in that time they installed a new head chef, the acclaimed Brad McDonald previously of New York, and the mezcal was seemingly wiped from their drinks list, bar one lonely cocktail. The Lady Lockhart, a gin, cucumber, maraschino and lemon number, was a decent and well balanced hit of booze to start our dinner off with though. We were in for an early, pre-cinema dinner and the room was dark and atmospheric, tables lit with candles, a bustling but quiet kitchen pass at the back of the room. Catfish goujons with remoulade and grilled chicken oysters with mustard were nuclear-hot, but once cooled were a tasty little number. I had incredible difficulty in choosing from the mercifully short menu - everything sounded amazing. Dirty rice with brown crab and smoked oysters (£14.50) was probably my least favourite dish of the evening. Although the rice grains were pearly and cooked well, I found the overall flavour a little too fishy. Catfish gumbo (£9) was far better; soft chunks of fish with a thick, spiced stew heavy with the slime of okra (which I love). On to mains, and the cornbread which seems to be at the forefront of most critics' reviews had to be ordered (opening photo). We were not disappointed. It was drenched in butter, reportedly cooked with lard too for an extra crisp base. 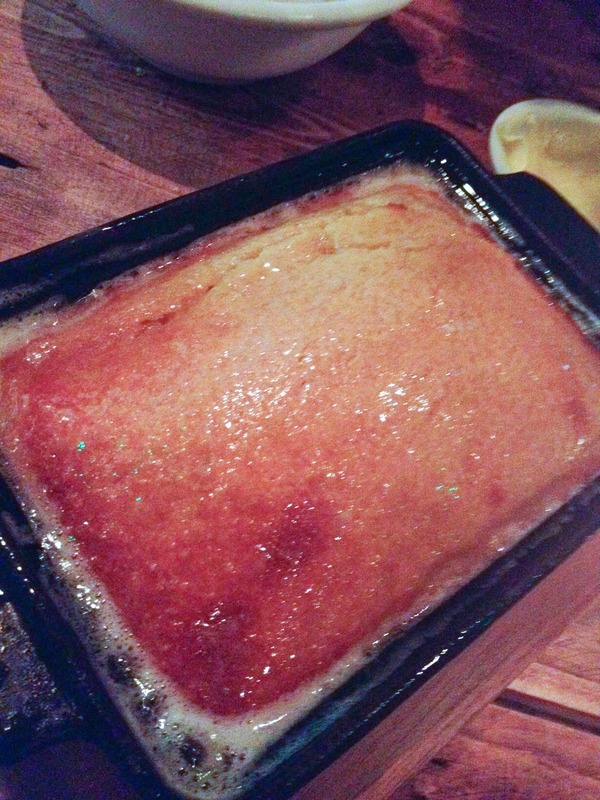 A hint of honey flavoured the bread and we ate it straight from the cast iron pan, no adornment needed. 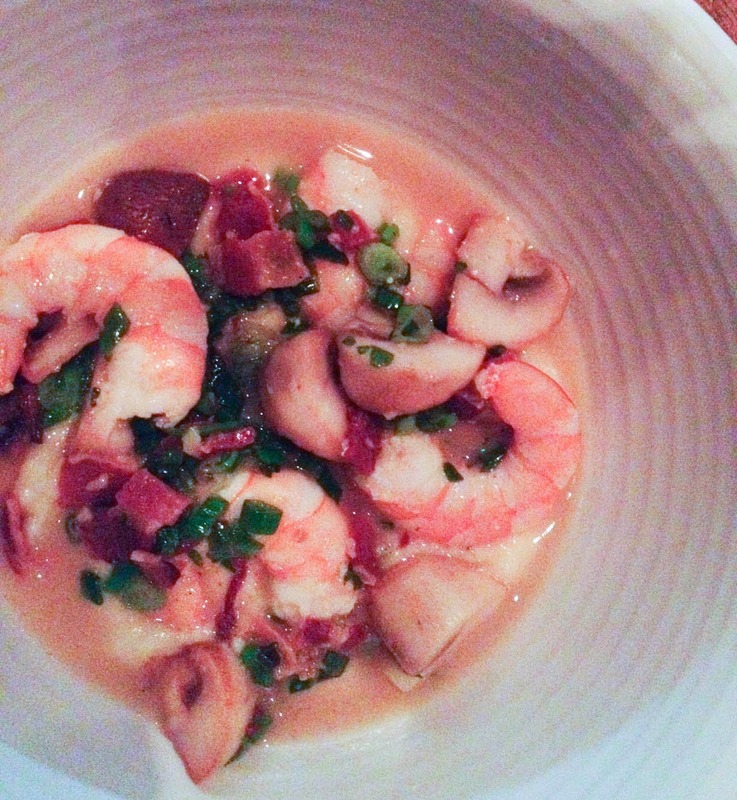 Shrimp & grits (£18, above) was somewhat smaller than I had imagined, though the polenta was cooked until smooth and creamy, the prawns sweet and crunchy. I found it overly salty, and towards the end I started to struggle. 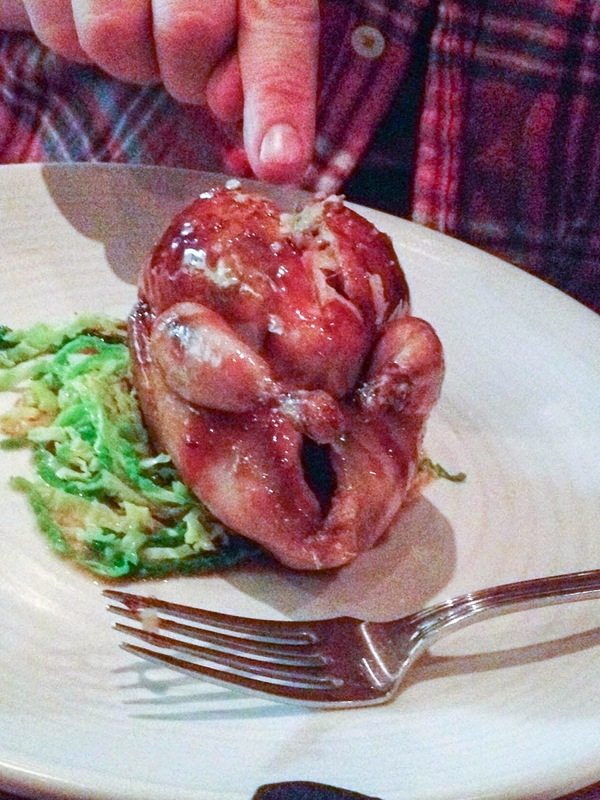 Stuffed quail with Madeira glaze (£16) was a cute little thing, and very cleverly stuffed with rice under the skin, so that it burst and spilled out when you cut into it. I love quail, and this was cooked as well as any I've had - blush pink meat, and crisp skin. We ordered coleslaw (£4) as we figured a place serving Deep South food would make it better than any other, but it was unremarkable. What was remarkable was the dessert - puffy light doughnuts with a chocolate sauce, made with rice flour (I think?) for extra crispness. Whoever is deep frying there knows their stuff. The bill, then. I suppose I shouldn't have been too shocked, since the menu prices were right there before me, but I wondered when a cocktail, a bottle of the cheapest house wine and a 3 course meal became a £70+ per head expenditure? I suppose I was taken aback as everything wasn't perfect, and it especially smarted a little as I had to ask for the 30% discount to be applied, for sitting down before 6:30pm. What was a nice little surprise when I made the online booking turned into a bit of an awkward one. Luckily I wasn't on a first date. 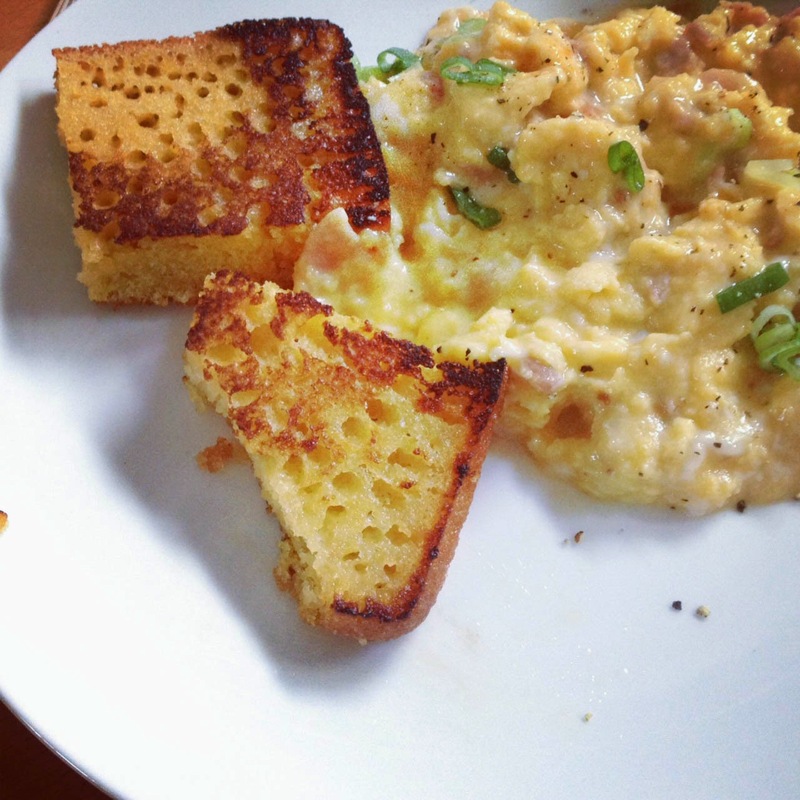 Still though, we were able to box up the leftover cornbread which my very clever boyfriend fried the next day for breakfast with scrambled eggs, which turned out to be one of the best breakfasts I've had in recent memory, so you know, all is not lost.